How many photons (energy) reach the surface of the Earth on Average? 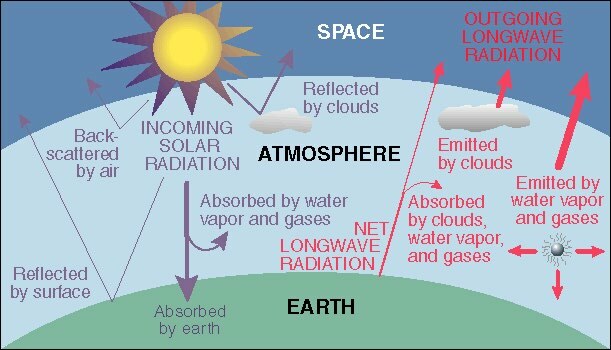 Short wavelength (optical wavelengths) radiation from the Sun reaches the top of the atmosphere. So the total reflectivity of the earth is 31%. This is technically known as an Albedo . Note that during Ice Ages, the Albedo of the earth increases as more of its surface is reflective. This, of course, exacerbates the problem. 19% gets absorbed directly by dust, ozone and water vapor in the upper atmosphere. 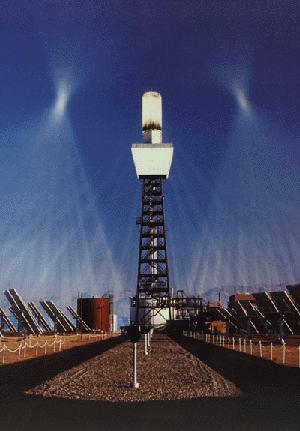 This region is called the stratosphere and its heated by this absorbed radiation. Loss of stratospheric ozone is causing the stratosphere to cool with time this has caused some of use stratospheric cooling as an argument against the occurence of global warming. The two are not connected at all. 4% gets absorbed by clouds located in the troposphere. This is the lower part of the earth's atmosphere where weather happens. This part of the equilibrium cycle is being changed as the troposphere, particularly at tropical latitudes, is getting cloudier. The remaining 47% of the sunlight that is incident on top of the earth's atmosphere reaches the surface. This is not a real significant energy loss Therefore it makes absolutely no sense to put solar panels in orbit and then "beam" the energy back to the surface. How much energy from the sun reaches the surface of the Earth on Average? Note that we measure energy in units of Watt-hours. A watt is not a unit of energy, it is a measure of power. 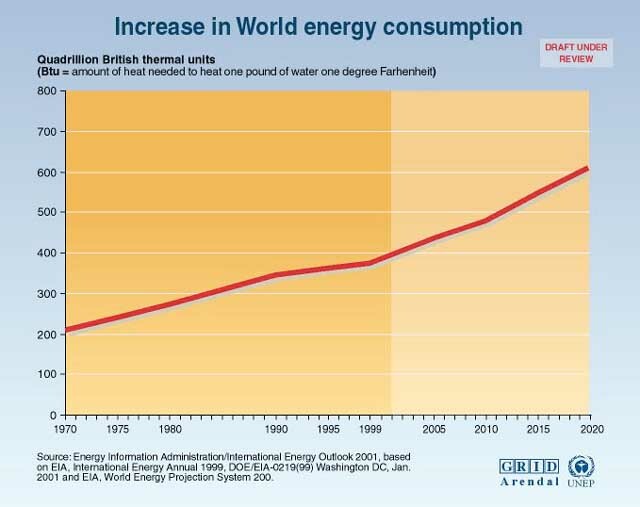 Average over the entire earth = 164 Watts per square meter over a 24 hour day So the entire planet receives 84 Terrawatts of Power our current worldwide consumption is about 12 Terrawatts so is this a solution? There is a large amount of infrastructure (e.g. cost) required to convert from potential to deliverable energy. But to go from energy received to energy generated requires conversion of solar energy into other forms (heat, electricity) at some reduced level of efficiency. We will talk more about PV cells in detail later. For now the only point to retain is that they are quite low in efficieny! A typical household Winter energy use is around 2000-3000 KWHs per month or roughly 70-100 KWH per day. Assume our roof top area is 100 square meters (about 1100 square feet). In the winter on a sunny day at this latitude (40o) the roof will receive about 6 hours of illumination. = 180 KWH (per day) more than you need. At best, this represents 1/3 of the typical daily Winter energy usage and it assumes the sun shines on the rooftop for 6 hours that day. Another example calculation for Solar Energy which shows that relative inefficiency can be compensated for with collecting area. A site in Eastern Oregon receives 600 watts per square meter of solar radiation in July. Asuume that the solar panels are 10% efficient and that the are illuminated for 8 hours. How many square meters would be required to generate 5000 KWH of electricity? expensive (25-50 cents per KWH). Direct conversion into electricity Photovoltaics; conversion of solar photons into electrons that flow down a semi-conductor. Main problem is low efficiency (about 10%). When photons strike a metal, their energy is used to liberate loosely bound electrons and therefore induce a current. This is the principle behind Digital Cameras (all college graduates should know how a digital camera works -- its a literacy test). To make use of the photoelectric effect, we need material that is a good conductor of electricity and which can be manufactured in bulk at reasonable cost. This conditions strongly constrain the available choices. For most practical aspects, Silicon is the material of choice. is abundant on the earth and readily found in the crust. It is a direct product of fusion inside stars. It can be easily recovered from the crust and mass-produced. Computers are cheap because silicon works well for circuit boards and is an easily recoverable material from the earth's crust. 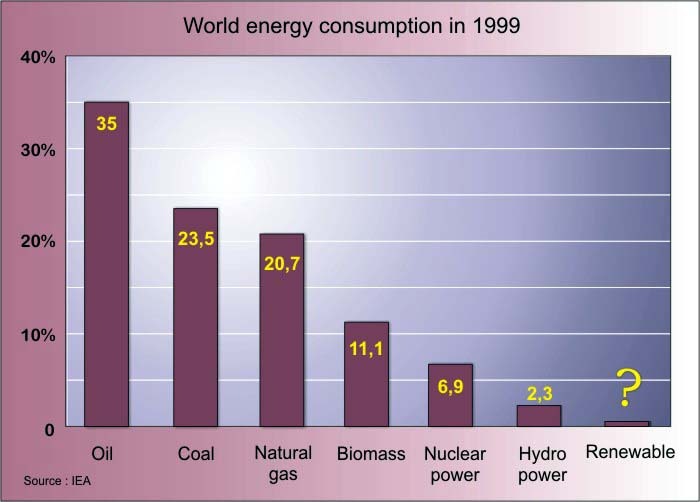 The result is a world-wide economy centered around semi-conductor technology. Under normal circumstances, there are no free electrons available in silicon to conduct electricity. All the electrons are used to bind the atoms in place to form the crystal. The conduction band is empty and therefore no current can be carried by the material. Hence, if a silicon atom receives at least 1.11 Electron Volts from some source, a valence electron will move to the conduction band. Once an electron is in the conduction band, the material can carry a current and the material is now a conductor. So much energy is 1.11 Electron Volts? 1.11 eV corresponds to the energy that a photon of wavelength 1.12 microns has. 77% of the energy from the sun is carried in photons with wavelength less than this and therefore can move a valence electron in silicon into the conducting band.